Hello Disney and Crafty Friends! 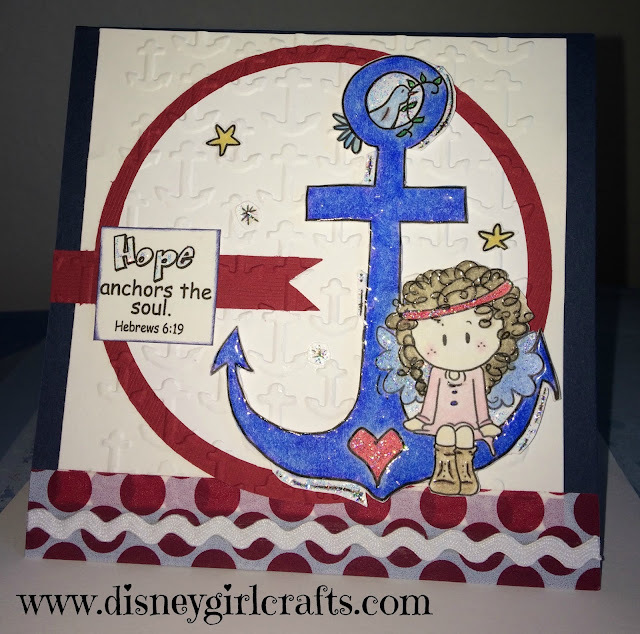 It is time for a new monthly challenge over at Scrapbook Blessings Club. I love being part of the SBC Design Team. We have a few new gals on our team so be sure to be on the lookout for them. All of the Design Team has done a beautiful job with this challenge. We are spotlighting a sketch with the option to use Washi Tape. I followed the sketch and I used Washi Tape. A HUGE thanks to our awesome sponsor, Bugaboo Digi Stamps, for the super cute image. As soon as I saw this one I knew that it was made for me. I absolutely love the verse!!! I hope that you will join in on this challenge. I love seeing what you create! To join the challenge head on over here and link up. Thanks so much for stopping by. Have a magical day!! Cute! I like your anchor embossing folder. Love the anchor! Very cute! This is such a cute image and I know that anchor is keeping "cruise" in your thoughts.